The Grundig G2 Reporter is the newest radio in Grundig’s portable shortwave radio line-up. 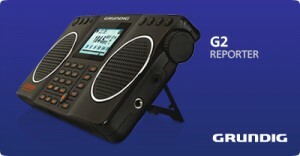 The Grundig G2 starting shipping in April 2012. This will be the first shortwave radio Eton/Grundig have released since the Grundig S450DLX. Read our post including the Grundig G2 press release on the SWLing Post. This entry was posted in Grundig, Portables and tagged G2, G2 Reporter, Grundig, Grundig G2 Reporter, Reporter. Bookmark the permalink.